A couple of weeks ago I made a purchase from DHC, buying eye creams for myself and my sister. You can choose up to 4 samples and I ended up choosing sample packets of the Q10 Moisture Care Liquid Foundation in Natural Ocher 02. DHC ships very quickly and I was able to test the sample. I really liked the feel and coverage of the foundation but felt that the color was a slight bit too light on me. I decided to go ahead and order Natural Ocher 03, hoping that it wouldn't be too dark. Again, the shipment arrived very quickly and I've played around with it for a few days now. I think that Natural Ocher 03 is just slightly too dark but I have found a way to work around it so I will probably order another foundation in Natural Ocher 02. Yes, I like this foundation very much. According to the DHC website, this foundation is ultra-moisturizing and age defying. It contains the free radical-fighting super antioxidant coenzyme Q10. It provides full, even coverage for a flawless-looking skin. It also contains a blend of collagen, elastin and oat kernel extract which all help to moisturize and plump the skin to help minimize the appearance of fine lines. 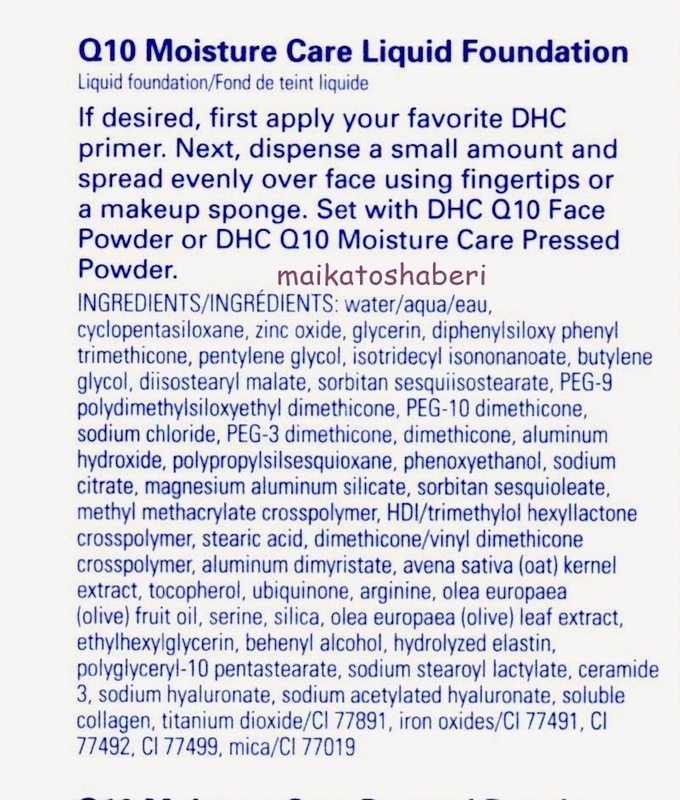 I like the way that DHC includes a Product Directions and Ingredients Guide in their shipments. 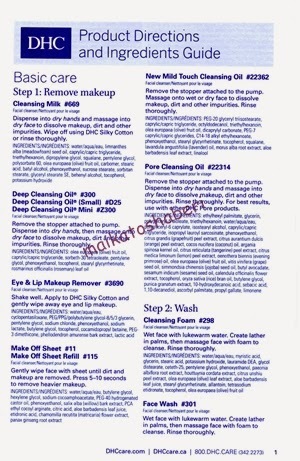 Here's the list of ingredients in the foundation. You can click on it to bring it up in a larger size. So, does it live up to all of its claims? I think that it does with most of the claims. I love the coverage! It does cover very well without looking cakey. Some scary pictures are coming up. As you can see, I have a lot of freckles and that one big spot on the apple of my cheek, which I detest! Even using the small amount of foundation, it covered up my spots quite well. I don't know why my face looks so white in this picture but believe me, it's not that light. I literally use only one little dot of foundation under each eye. I do this because I like having under my eyes and the top of my cheeks to be lighter. I don't have to use any highlighter this way. Although it doesn't look like I need to, I still go ahead and conceal some of the smaller spots, finish off with powder and then finish up the rest of my makeup--contouring, blush and lipstick. As with all foundations, this does oxidize on me as the day wears on. For Hawaii, it has been quite cool these last couple of weeks so with the lower temperature and humidity, I haven't been able to put it through the heat test. I find that with more humidity, it makes my face tend to perspire and that will make a foundation oxidize even more. Also since it has been cooler, this foundation didn't feel as moisturizing as I thought it would. I just have to make sure that I moisturize well until regular weather starts again. I may have to do another quick review when the summer months come about and I can see how long lasting it is. For now, it lasts well over 10 hours on me. Being that this is considered a moisturizing foundation, I don't think that it feels heavy, nor does it leave my skin feeling tacky. It doesn't have a dewy finish that most moisture foundations have so it doesn't leave you looking like you have oily skin. I think that this is a great product and I'm so glad that I tested it out. It's a nice match for my skin tone in that it's not too yellow nor is it way too pink. DHC has this on sale until the end of the month. You can read up on it here, which shows the different color choices. It's not great, only 4 shades, but this is typical of Japanese foundations. @Yasumi--Thank you! I like freckles too and think that they look cute but just not on me. LOL! Hello Kathy. Wow, that foundation gives great coverage without looking heavy on the skin. I have freckles too and am always trying to find the best face product to cover them with.